Update (10:28am ET Sept. 26): US president Donald Trump has tweeted about Puerto Rico’s power outage. Puerto Rico’s 3.4 million island residents are completely without power (paywall) following the island’s lashing by Hurricane Maria. Even before the storm battered the US territory—just two weeks after Hurricane Irma inflicted an estimated $1 billion in damage on the island—there were already problems with its electrical infrastructure. Now those issues will be felt more acutely, as utility workers attempt to get aging power plants back online. The Puerto Rico Electric Power Authority (PREPA)—which has said it needs $4 billion to replace its plants—filed for bankruptcy July 2. The power authority oversees more than 2,470 miles of transmission lines that run from its plants, and then close to 31,500 miles of shorter lines that transmit electricity from the power grid to individual customers, according to The Washington Post (paywall). 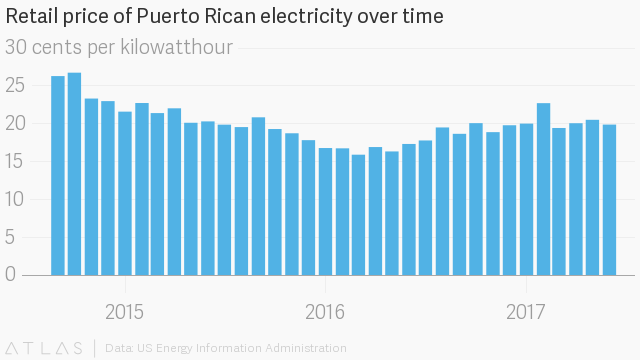 Trump’s comments aside, one of the challenges for returning power quickly is that Puerto Rico relies almost entirely on electricity generated by fossil fuels to power its antiquated and exposed grid. In Florida, Irma had cut power to more than 6.7 million people. But some lights were back on more quickly than others thanks to homes and cities that had invested in solar panels, according to Inside Climate News. That suggests that renewable, decentralized sources could play a significant role in how communities can recover faster after destructive storms. It’s far from a reality on Puerto Rico, where power generated from alternative and renewable sources is almost non-existent. Compare that to the mainland US, or even Costa Rica—where 98% of electricity came from renewable sources in 2016—for examples of more progress in diversifying energy sources. Nearby, the Dominican Republic also relies on fossil fuels for most of its electricity. Still, in 2012 wind and hydroelectric power accounted for 14% of generation there, according to the Energy Transition Initiative (pdf). Because Puerto Rico is so reliant on fossil fuels, electricity rates have traditionally been close to double what mainland Americans pay. And while those rates have decreased somewhat in recent years as the price of oil dropped, Puerto Rico still paid more than any state or territory except Hawaii. That is, in part, because the island does not produce or refine crude oil, forcing it to import almost all of its supply. The International Monetary Fund has found that more than half of Caribbean nations rely almost exclusively (pdf) on fossil fuels. This poses problems every hurricane season, when high winds and torrential rain knock out power and inflict significant damage on public utilities.